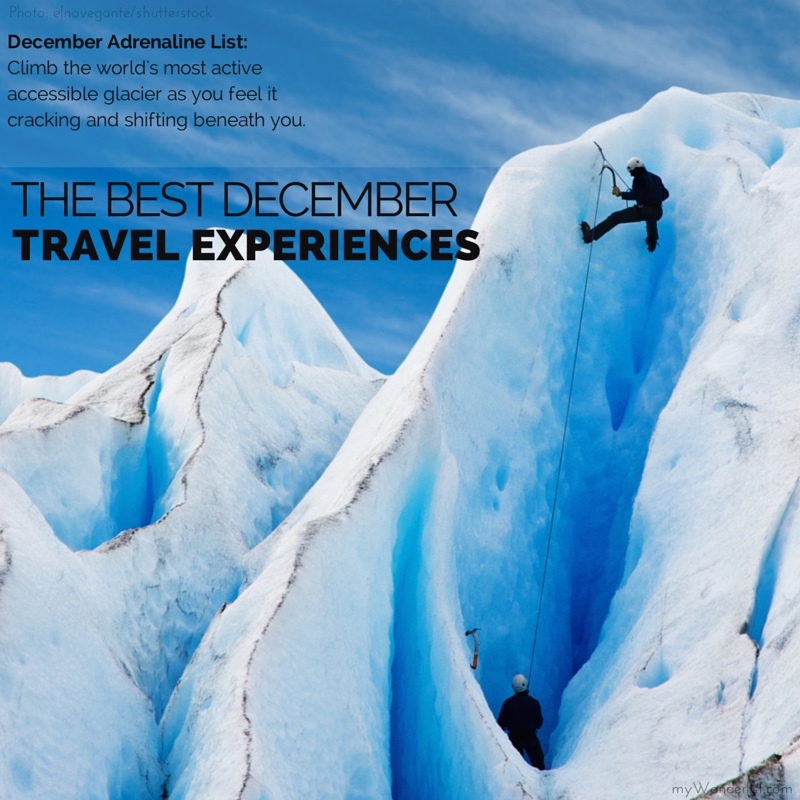 December brings you more great travel experiences that push the limits, engage with authentic culture, encounter animals in the wild, participate in the most iconic athletic challenges and find pure bliss. Everyone has different tolerances for risk, so please check safety conditions and plan appropriately. 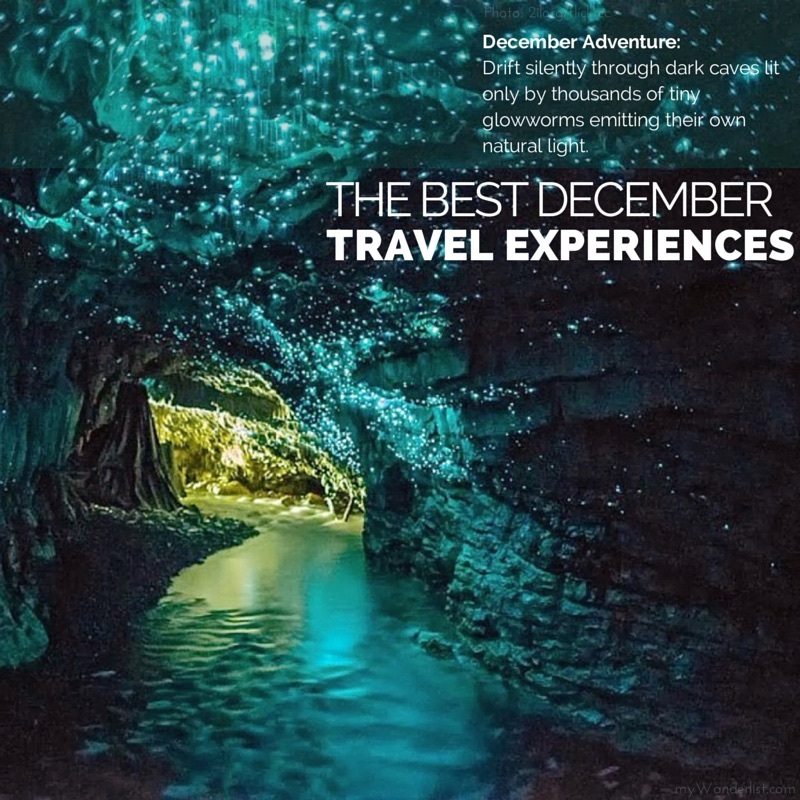 December includes some of the most unique adventure sports across Patagonia, Central America and New Zealand like the glow worm caves of Waitomo and ice climbing the world’s most active accessible glacier. 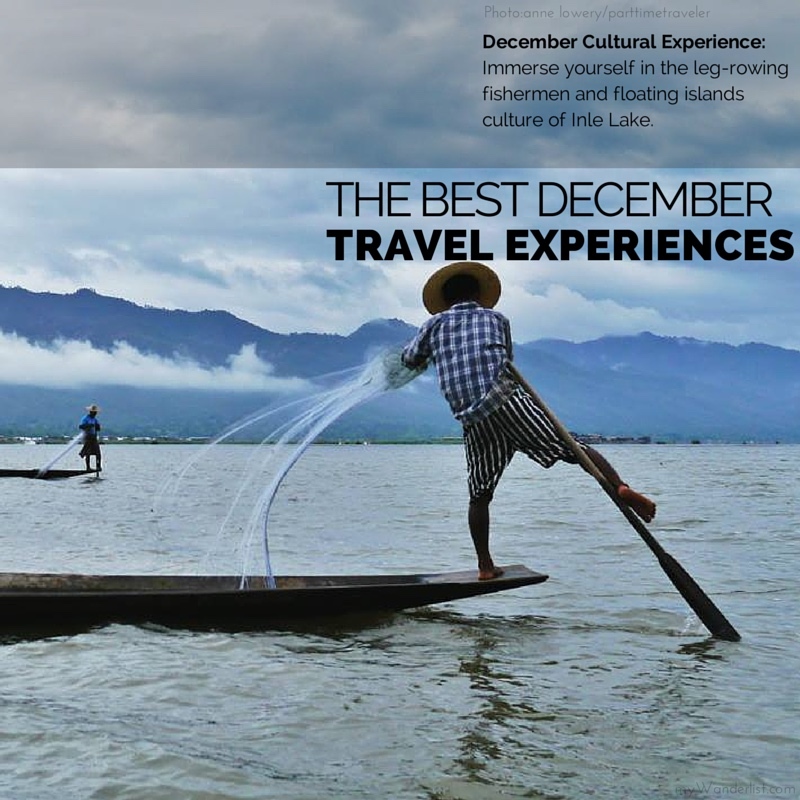 Timeless cultural experiences include hot air ballooning over Laos and the isolated Inle lake people of Myanmar. 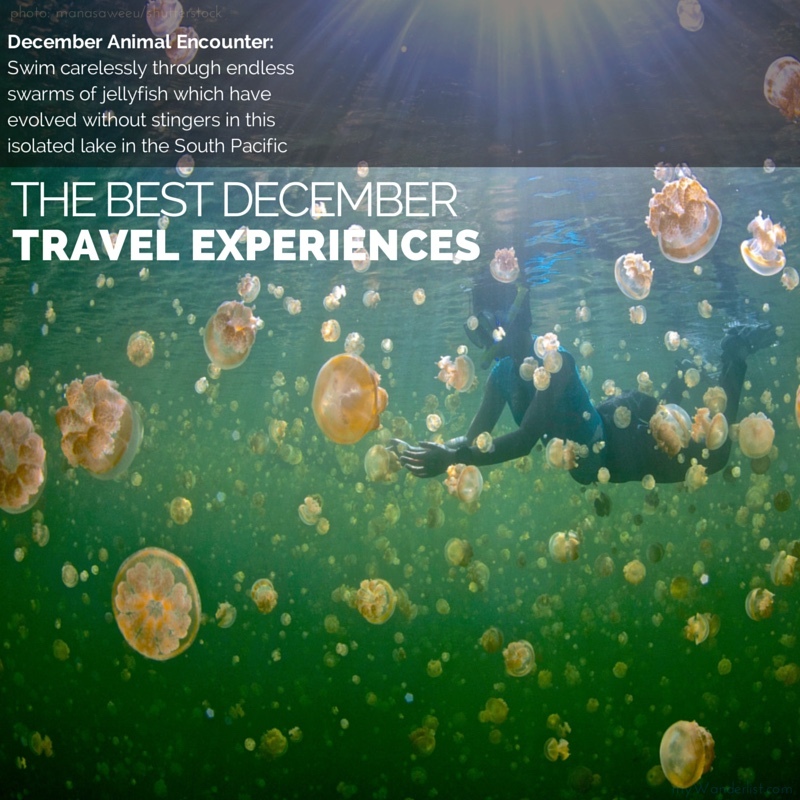 Get up close with sea creatures as the humpback whales migrate along the Mexican coast and the strange jellyfish lake in Palau. 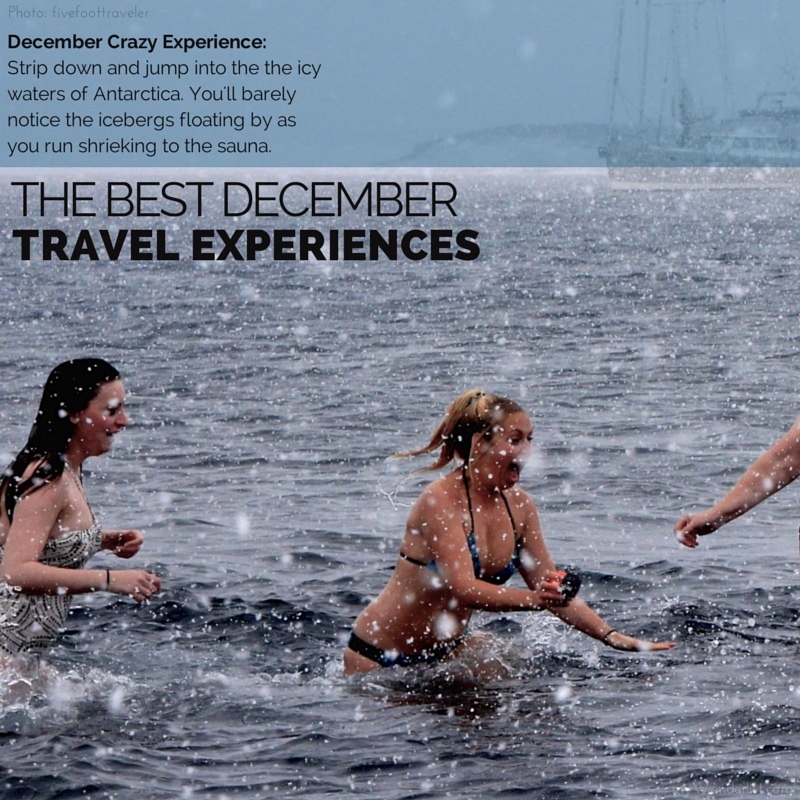 Strip down, run across the ice and jump into the the freezing waters of the coldest place on earth, Antarctica. You’ll barely notice the icebergs floating by as you run shivering and shrieking to the sauna but you will definitely come out of it with a sense of accomplishment. Explore the ancient city of a lost empire set against heaps of giant boulders in the Indian countryside. 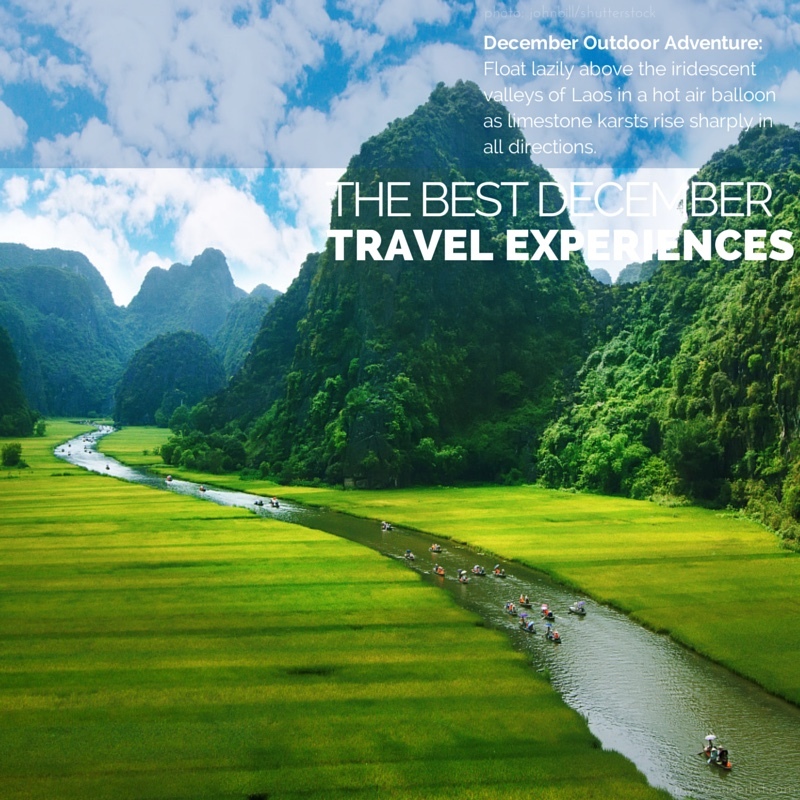 Go temple hopping, rock climbing, or simply marvel at the ruins and natural wonders. The former capital of 14th century empire Vijayanagar is best explored by bicycle, especially during the cooler season starting this month. This is one of the best places in India to charm a king cobra. There’s a Monkey in My Bed! 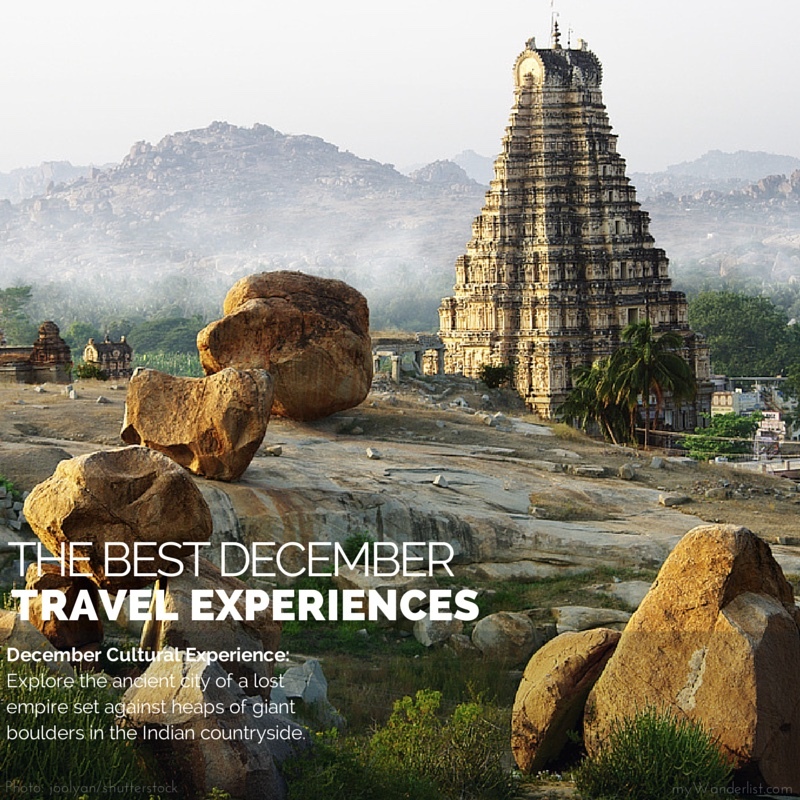 – A Trip to Hampi, India. 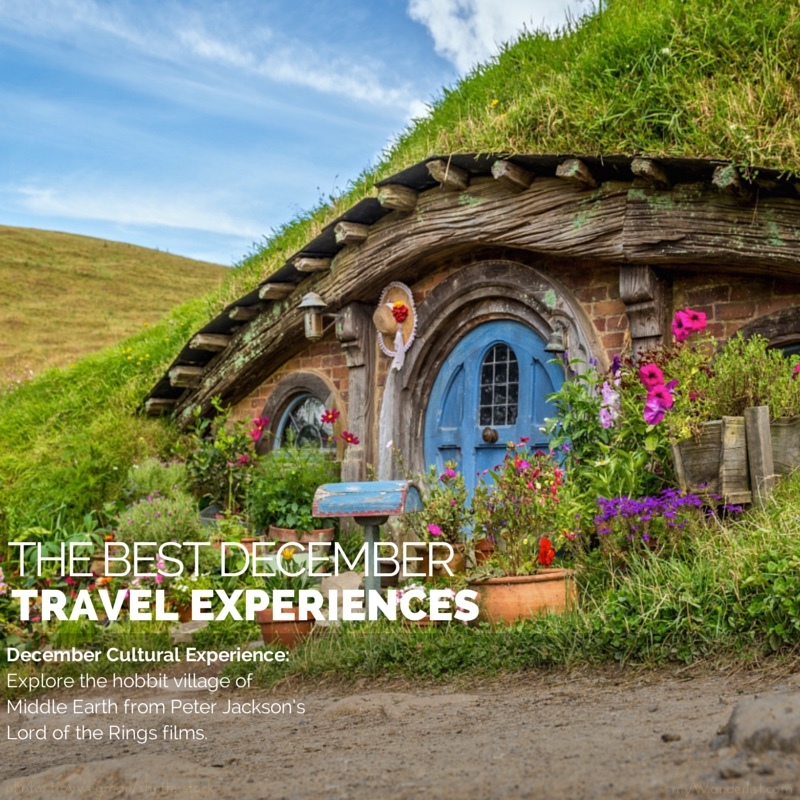 Explore the hobbit village of Middle Earth from Peter Jackson’s Lord of the Rings films. Watch your head as you duck past the small dwellings, surrounded by green rolling hills. The buildings created as a film set remain permanent fixtures in Matamata, New Zealand, in which December is a prime summer month to visit. 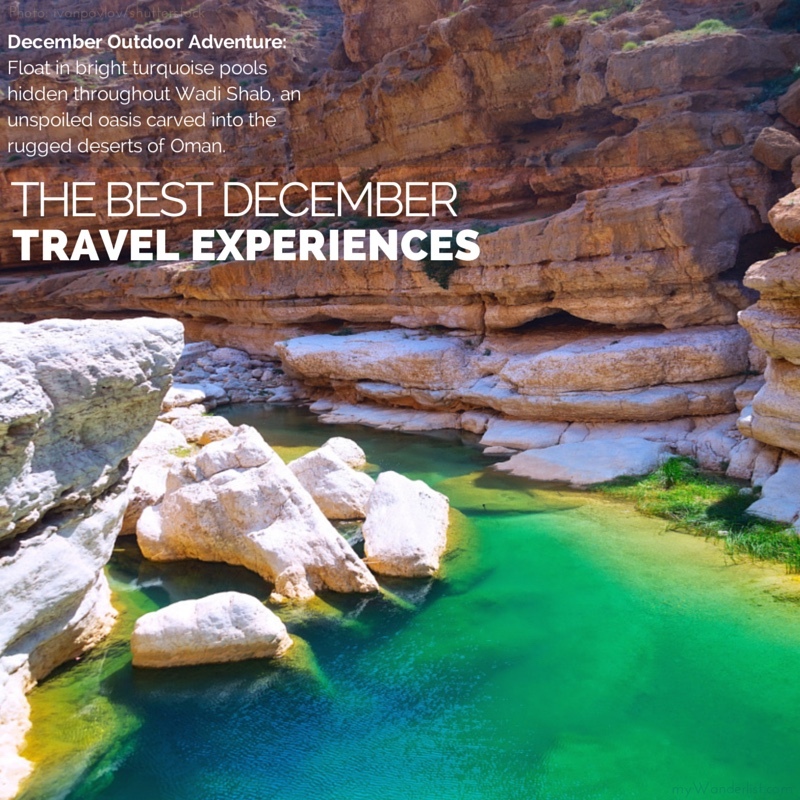 Float in bright turquoise pools hidden throughout Wadi Shab, an unspoiled oasis carved into the rugged deserts of Oman. Hike through the towering orange and yellow sandstone canyon walls and cool off with a refreshing swim in the clear, calm streams shaded by banana palms. You’ve found desert heaven. 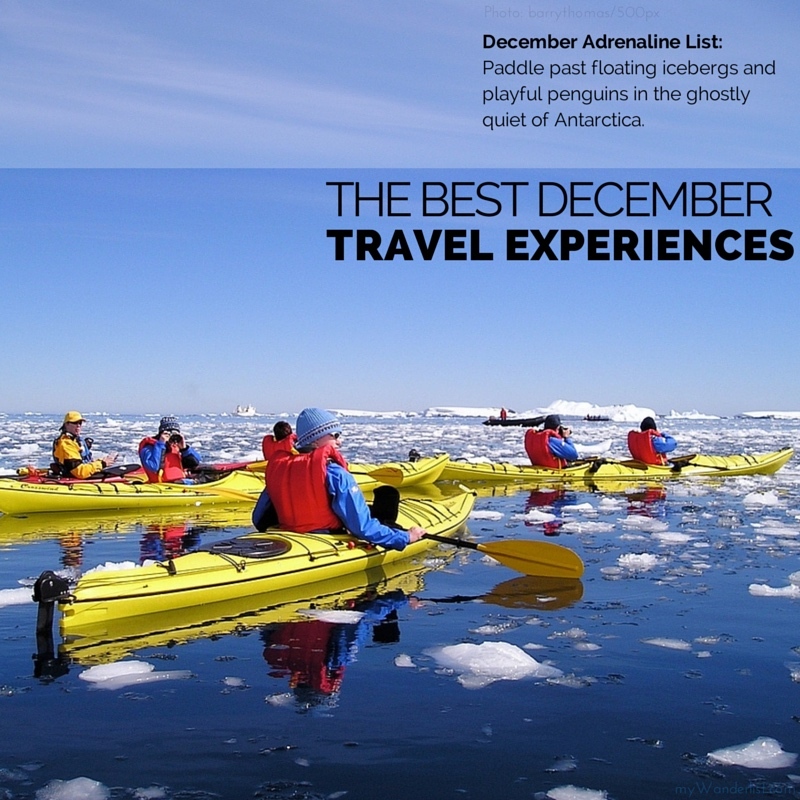 December is the perfect time to go without getting overheated. 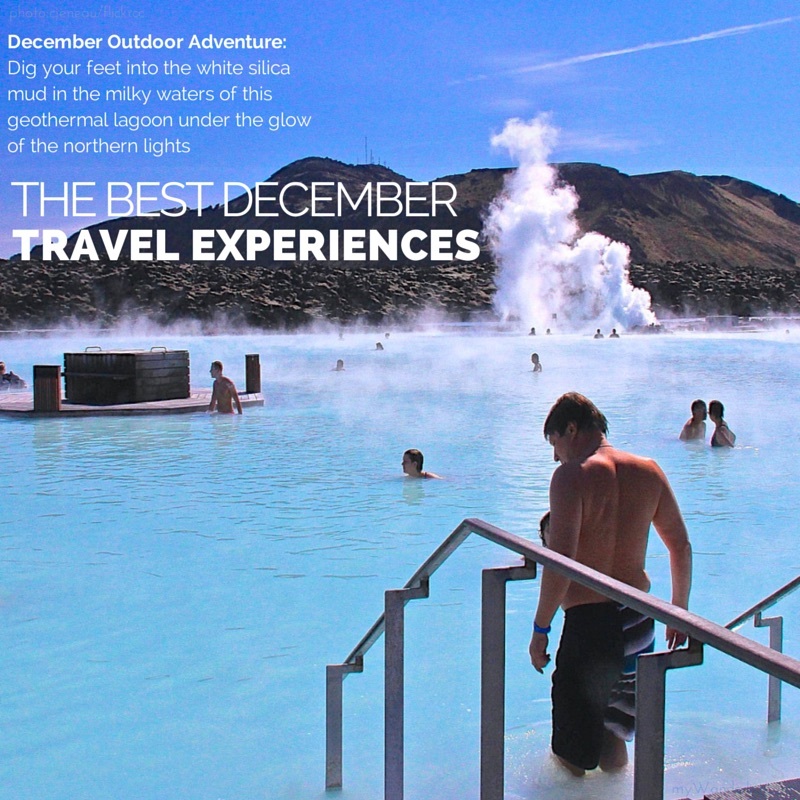 Dig your feet into the white silica mud in the milky waters of this geothermal lagoon under the glow of the northern lights. Heated waterfalls, geothermal steam baths and indulgent spa treatments abound, not to mention a bar in the middle of the pool. For the easiest view of the Aurora Borealis, IcelandAir offers free stopovers between Europe and North America. Stand a few feet from a fully-grown silverback gorilla in the misty hills of Impenetrable National Park in the highlands of Central Africa. These impressive creatures can punch 6 times harder than a heavyweight boxer. 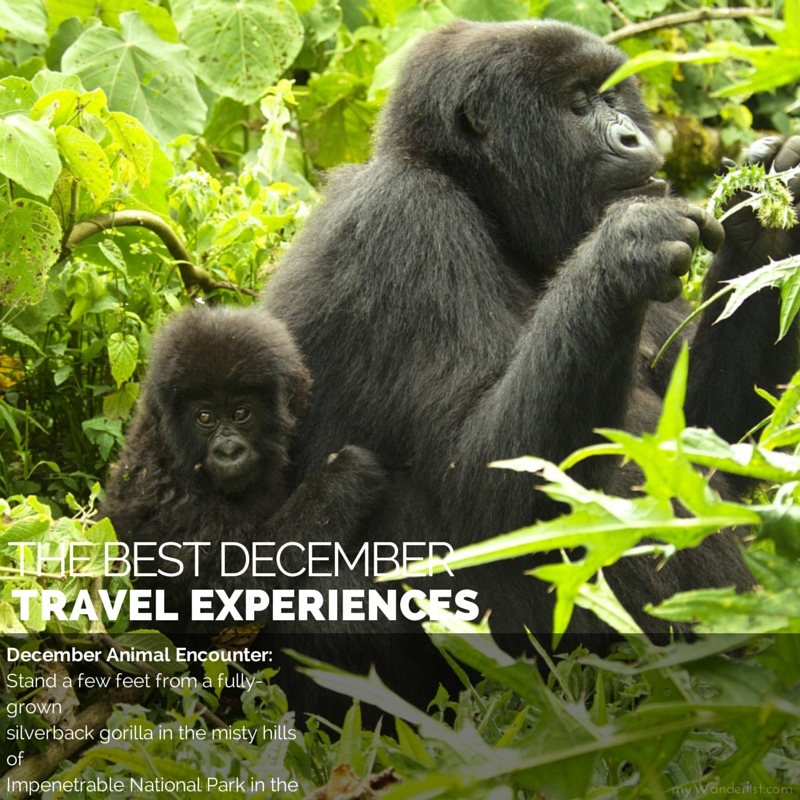 December brings the dry season to sister parks on the corner of Uganda, Rwanda and DR Congo. 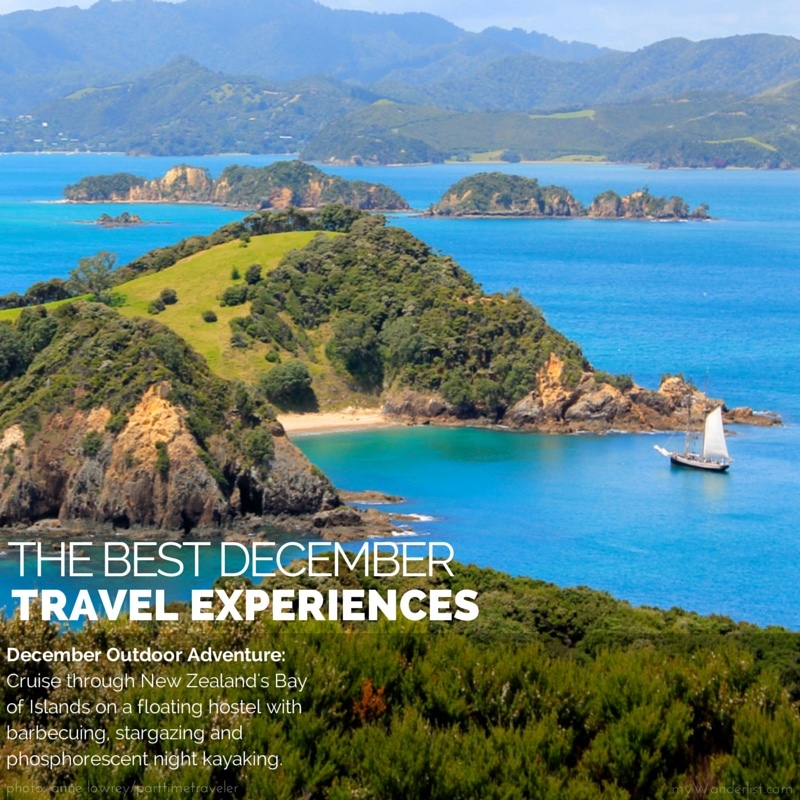 January and February are great months to avoid the Holiday crowds. Swim carelessly through endless swarms of jellyfish which have evolved without stingers in this isolated lake in the South Pacific. These jellyfish have thrived in isolation over the last 10,000 years without natural predators. 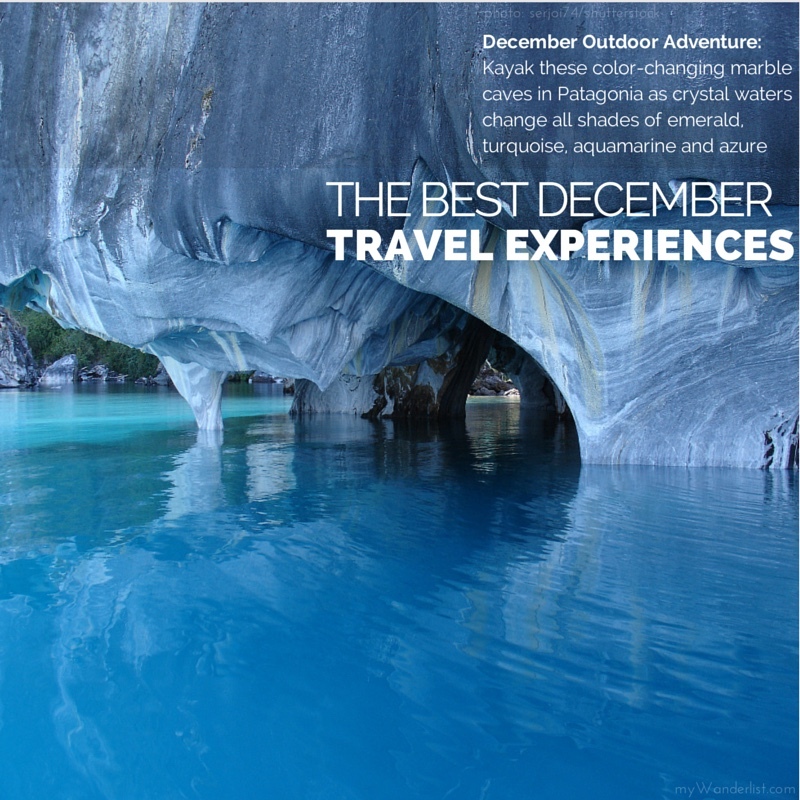 December brings an end of the rainy season and the best weather of the year to this tropical archipelago. Watch helplessly as your captain chums the waters to attract hoards of sharks then invites you to jump in. at shark ray alley in Belize. The best time to visit Belize is from late November to mid-April, during the country’s dry season. Loved this list. So many destinations, so many activities. We do have polar bear plunges in winter here in Canada, but to do them in the Antarctica would be so “cool”. Yeah, that is a great one! Funny story, a boat dropped me on that beach by myself. A few hours into the indefinite wait, I swam over to that lake. It was really freaky jumping in by myself. Not knowing how deep it was and only hearing that it was possible to swim in there. Yeah, awesome place. Probably better in September-ish, right? Isn’t it rainy season in Sulawesi now? Yes we went twice to that jelly lake, one time it was full of jellyfish, we couldn’t swim around them! Great and strange experience. 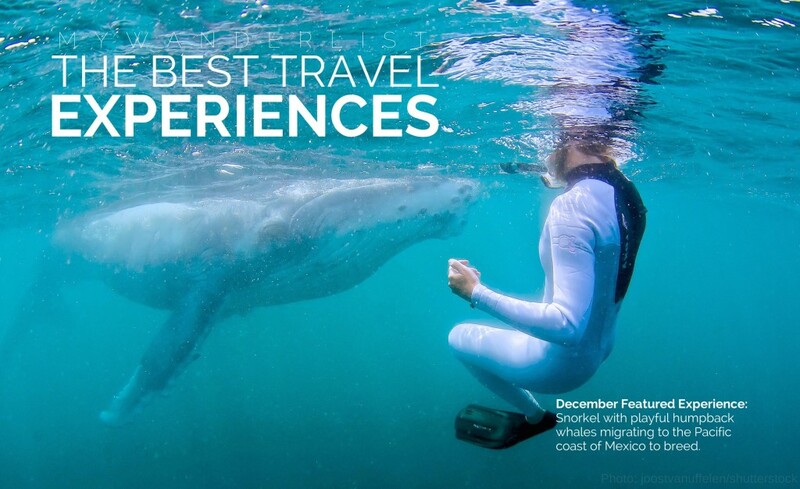 What company offers the swimming with humpback whales in Mexico? I’ve been to the Silver Bank, Dominican Republic 4 times with http://Www.aquaticadventures.com to swim with the North Atlantic humpback whales, and plan to go to Tonga in a few years, but hadn’t heard about this being possible in Mexico? 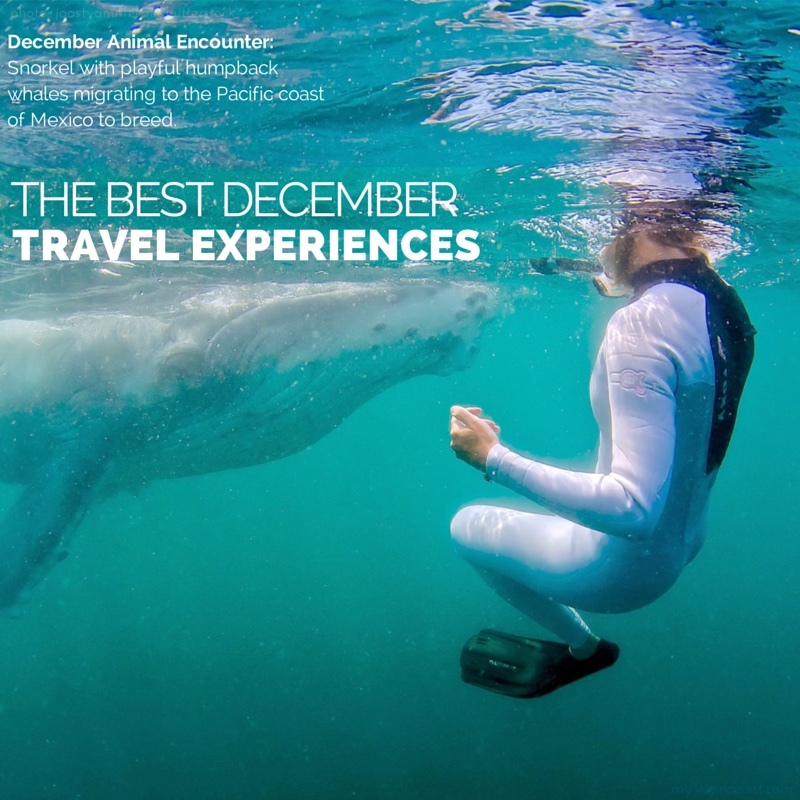 Hi Heather, although I can’t recommend a specific tour company, the most popular places to join an expedition are Puerto Vallarta and Cabo San Lucas. How was your experience at Silver Bank? 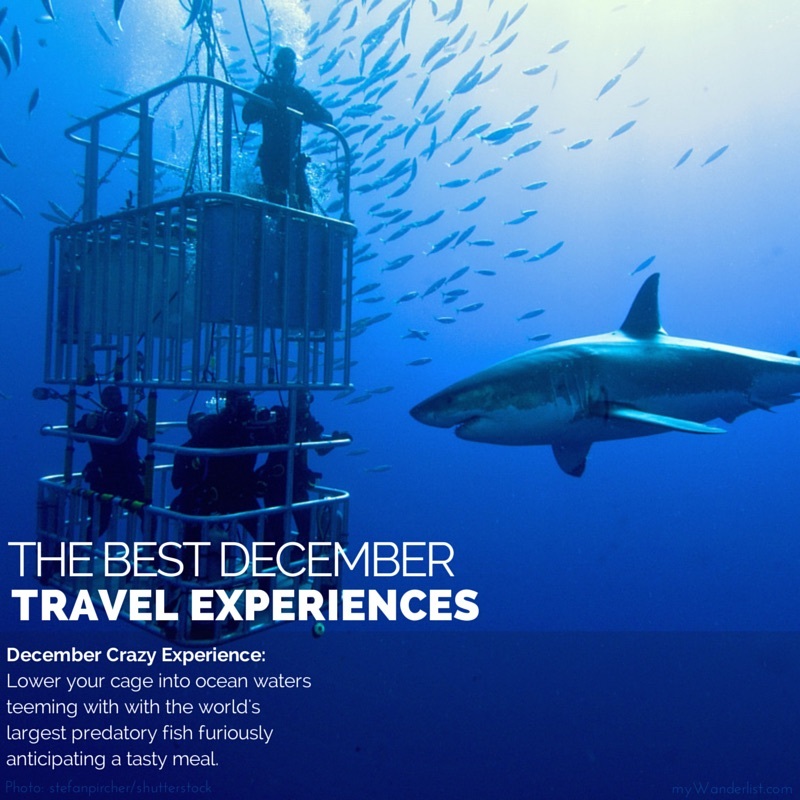 I’ve heard that is an excellent marine sanctuary. Done a few of these! Semi- conquered my fear of sharks in Shark Ray Alley! Which ones have you done that you would recommend, Katie? Shark Ray alley is a blast. 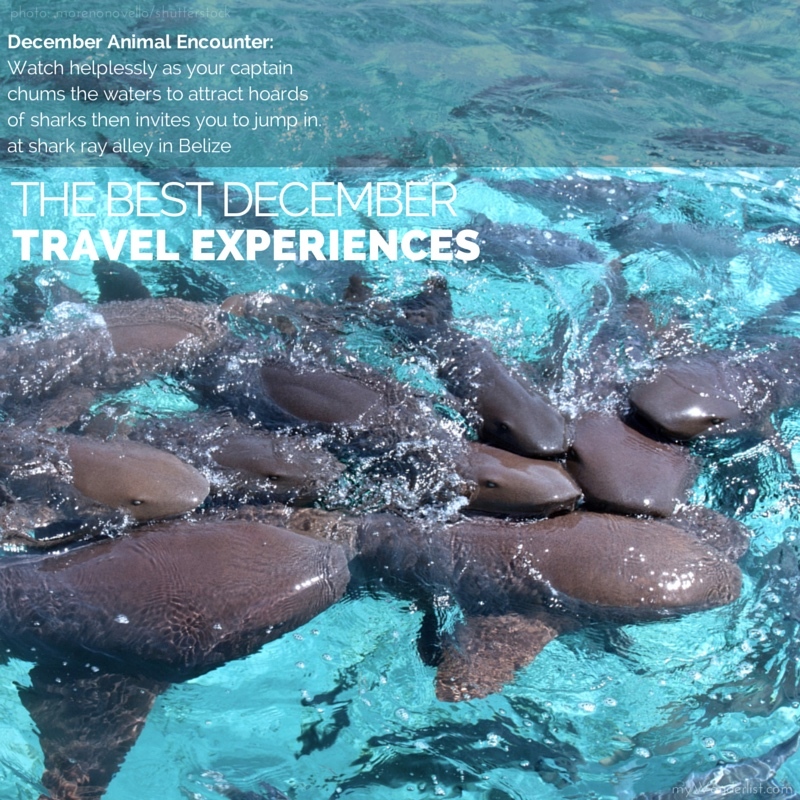 So what if they are basically domesticated and lack teeth, it is still a great story to tell your friends and a wonderful way to get up close with animals in the wild. haha they are still sharks! Just seeing these animals swim under you is scary! Our guide showed us his arm where he got “bit” and it was not a pretty scar! 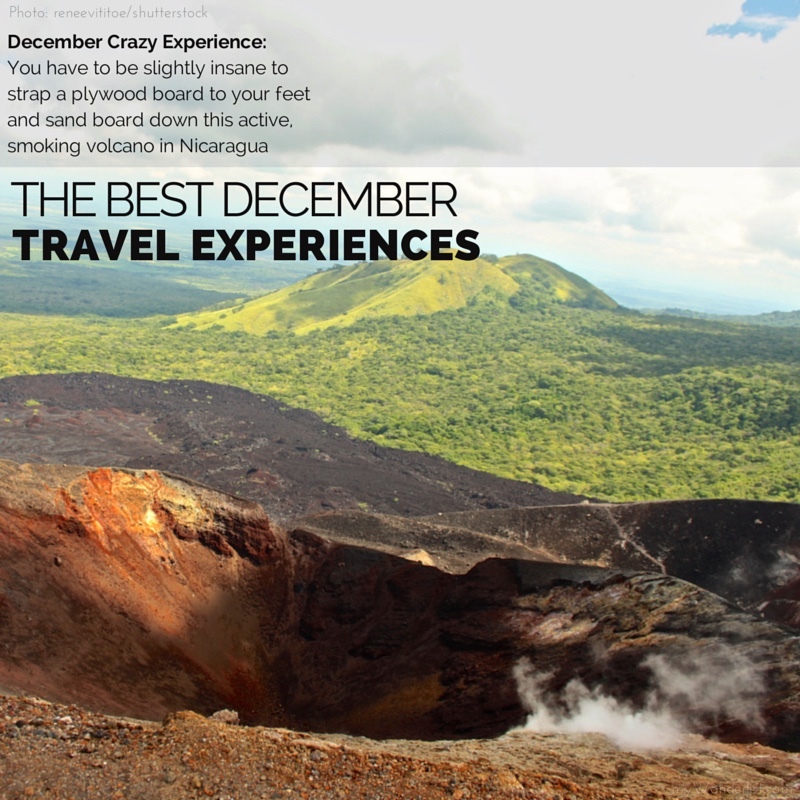 I would also recommend volcano boarding in Nicaragua for quite the adrenaline rush. And skating in NYC during Christmas is a classic tourist activity that is definitely worth it, though as a local I try and avoid that area due to the crowds! Yes, volcano borading is such an insane concept but so much fun. I love how it gets steeper as you go down so you can’t actually see the bottom. Sure, ice skating in Central park is a little crowded, but it is really the quintessential New York Holiday experience. I guess the name has changed from Wollman Rink to the Trump Skating Ring. A little narcissistic, huh? Man, that’s a lot. Now, I can’t pick one. May after The Skating Rink in NY, then The Polar Bear Plunge, and to finish it off… The Floating Hostel for some barbecues and stargazing. 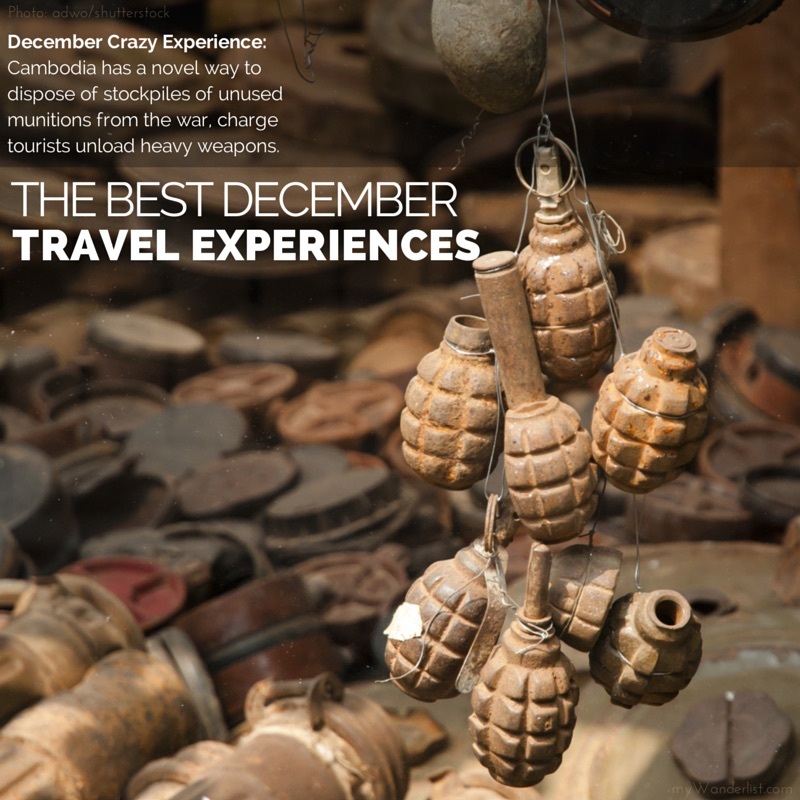 Fantastic – we’re in Non Khai, Northern Thailand, during December/January. Will make it a point to go up in a hot air balloon. It’s something I’ve never done and always dreamed of doing. I can’t wait to hear about all of your adventures, Frank. What exciting things do you have planned? Swimming with humpback whales – I had no idea that was possible! 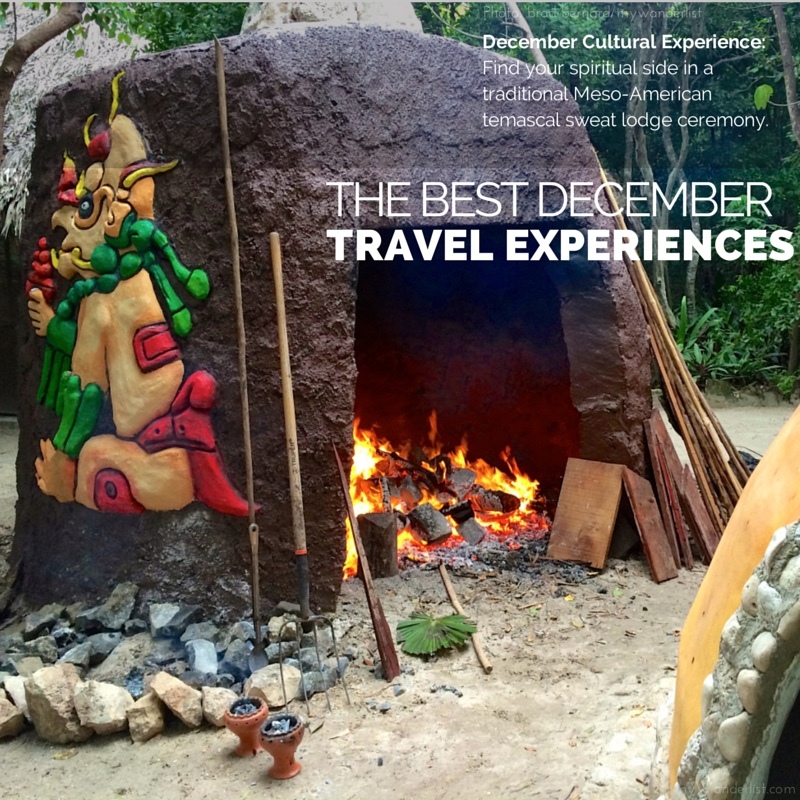 Your cultural experiences are absolutely amazing this month! I’ve done a few of them already, and I’m planning to do a few more in 2015. By the way, I really like your new menu. It’s very organized and easy to navigate! Thank you, Miriam. I know you have some really awesome things to add to the list, so let me know. I’m happy to link to your wonderful blog. I’ve been trying to figure out how to make it a better experience so let me know if you have any ideas. 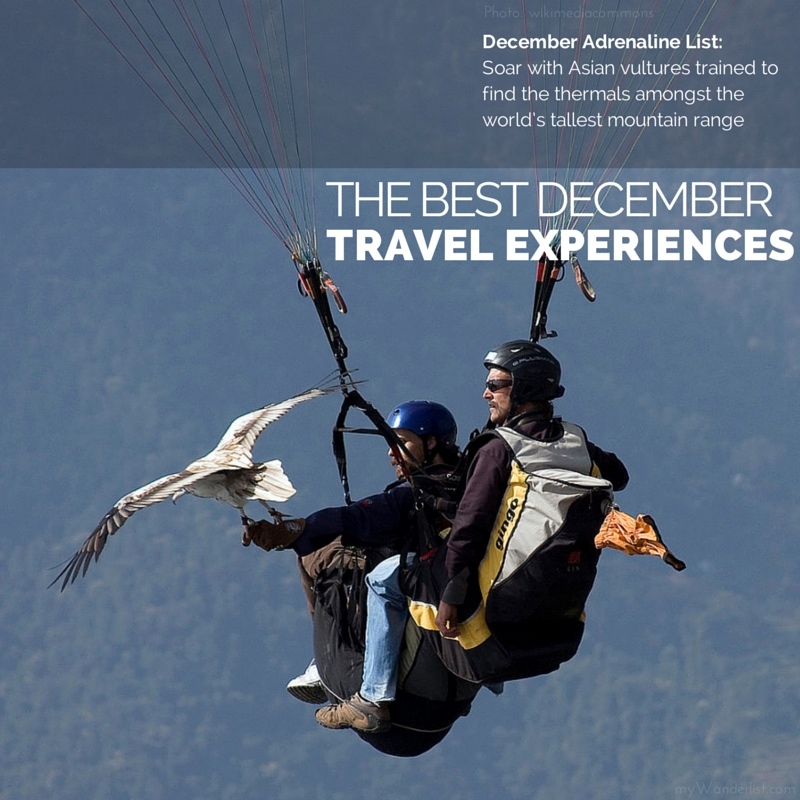 These adventures make me want to experience at least one!